Having been born and raised in New Jersey, Dr. Darlene Robe considers herself a true Jersey girl. 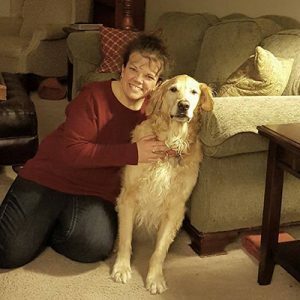 She earned a Bachelor of Science Degree in Animal Behavior from Bucknell University in Lewisburg, PA. After graduation from St George’s University of Veterinary Medicine, Dr. Robe practiced in Pennsylvania before returning to the state that she loves. Her professional interests include preventative care, hospice/end of life care and client education. She is always happy to talk to clients about their pets and answer their questions. Dr. Robe has experience in the mobile field, having worked as a house call veterinarian prior to officially joining the House Paws Team in December 2016. She enjoys the unique aspect of house calls as it allows her to see both her patients and their owners in a more relaxed setting than a traditional animal hospital. Passionate about keeping up to date on current medicine, you can often find Dr. Robe at one of the many continuing education lectures offered by others in the veterinary community. Outside of work, Dr. Robe enjoys exercising and challenging herself in the gym. She follows a functional fitness exercise program and credits this with allowing her to meet the physical demands of the job. Since she was young, Dr. Robe has always been surrounded by animals. Her current menagerie includes two dogs, two cats and a tank of fish.